I was newly in love and this seemed like an impossible nightmare. We – Mark and I – would never run out of things to learn, to say, to inspire, to challenge, to encourage, to deepen our love. Now we’ve been married for thirty-something years and we’re working to keep things fresh: Mostly. It’s a journey. It’s a conscious effort. When you say “’Til death do us part” these days – man – that can be a L O N G time. How do folks keep conversations fresh, connective, helpful, real? But, if we are to be in relationship to someone else we must keep launching our words as emissaries of hope and tentative connection else – what? Radio static? Terrifyingly unfathomable silence? OK – enough of the hyperbole. I had fun there. But I have – through years of conversations as a professional therapist, wife, mother, sister, friend – discovered The Rule of Five when it comes to learning about and engaging in great, powerful, connective conversations. And, as luck would have it, there are five Wednesdays in April for me to share each of these! Today I’m going with 1 and 2 since you’ll need to know my assumptions. And besides, I need week five for that little something special I have up my sleeve! You want great relationships – not mediocre ones. This teaching goes beyond Conversation 101. You are self-aware and learning all the time. These ideas are not for the denizens of denial. You are willing to take responsibility for quality conversations. This is not for the whiners and complainers. While you can use this information at a one-off work social, these tips are intended for those wanting, or in, longer-term relationships. “Conversation” is not just about the words. It includes the silences and non-verbal overlays. When you’re in a relationship for the long haul (think partner, parents, in-laws, kids) your conversations have to be versatile. Marriages don’t survive on the “What’s your favorite movie?” or “How was lunch?” level. 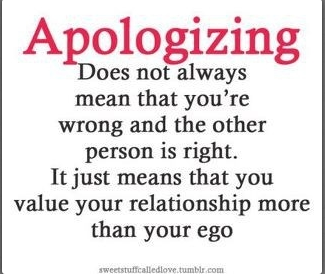 Healing – the willingness to apologize and forgive when we hurt one another. 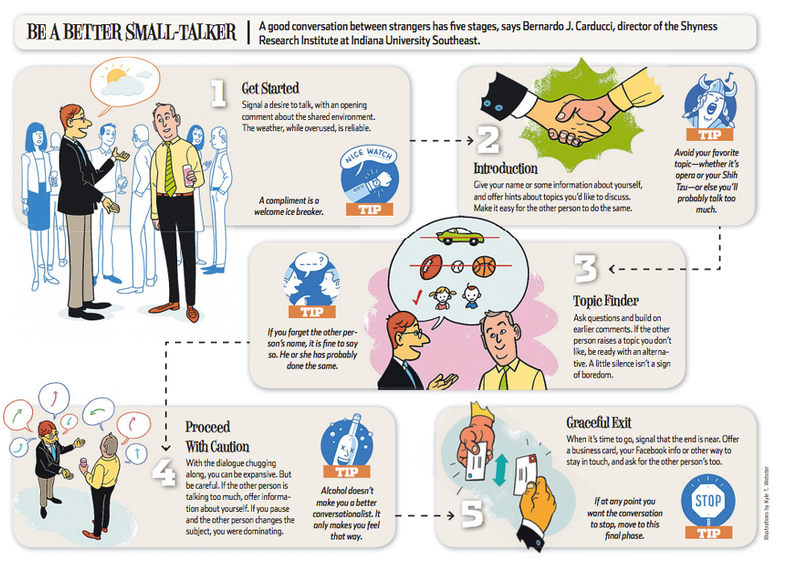 Here’s an info-graphic based on shyness-expert Professor Bernardo J. Carducci’s five (that “Five” again!) stages of a successful conversation. Did you see that sunrise? Boy it was breathtaking today! I found a new farm for happy-chicken, free-range eggs. What do you think of them? Oh, the neighbors are putting in a new planter box – I wonder what they’ll grow. Yup – seriously folks. These are long-term-relationship conversational bids for connection. You know how you could blow it? By hearing them as slightly mad one-liners, instead of conversational openers. Sure they could be the mad mutterings of the old cat lady down the road, but if you want a great relationship with the mutterer in your life then you need to also hear what is underneath: you need to listen for the unspoken sub text, which is “Hi there! You’re on my radar. Am I on yours?” And yes, you need to respond. These Connecting Conversations do not have to be long. A little friendly volley works wonders. Not in the mood? Nurturing the inner grump today? No worries, as Dan Wile writes, you can still honor the spirit of a Connecting Conversation by simply commenting on your state: “Hon, I’m all over those eggs. Right now I gotta dash. See you tonight – good luck with that meeting.” That right there – while brisk, is not brusque. It lets a partner know you heard and they are indeed still an important blip on your radar. If Connecting is the warp thread, Deepening is the woof. Every day we rally forth into the world to study, work, play, teach, shop, search – whatever. And we come back with our share of triumph and tragedy. It’s with our loved ones that we process this stuff – or at least, ideally. It’s how we converse about these daily experiences that builds or erodes our mutual trust, love and attachment. These conversations tend to go well to the extent one or both parties have some emotional fluency. For a brief overview I’m going to paraphrase from that master of emotional intelligence, Haim Ginott as explained in Chapter 1 of Faber & Mazlish’s How To Talk So Kids Will Listen (yes, this works for grown-ups too). So, imagine it’s the end of the day and you’re regrouping as a family. One of you has suffered some sort of indignation and wants to use this Deepening Conversation (though they don’t use that term!) to process what went down. They want to feel better. To understand why it felt so bad. To see if they need to respond. What do they need to keep this conversation feeling helpful and good? Here are 7 things they do not need! So, what might forward this conversation in a way that deepens your relationship? So, deepening conversations do more than Connecting. They let the other person know you not only heard them, but you are seeking to understand their experiences and get on their team. Once you respond thoughtfully, empathically, these conversations will keep spiraling deeper – have a go. See what you notice. These are those grittier conversations which often take place at that edge where we bug one another. The proverbial toothpaste and toilet seat perennial arguments that marriages are purported to crash upon. For these conversations, I am totally indebted to Marshall Rosenberg and his work in developing and teaching a process he calls Non-Violent Communication. 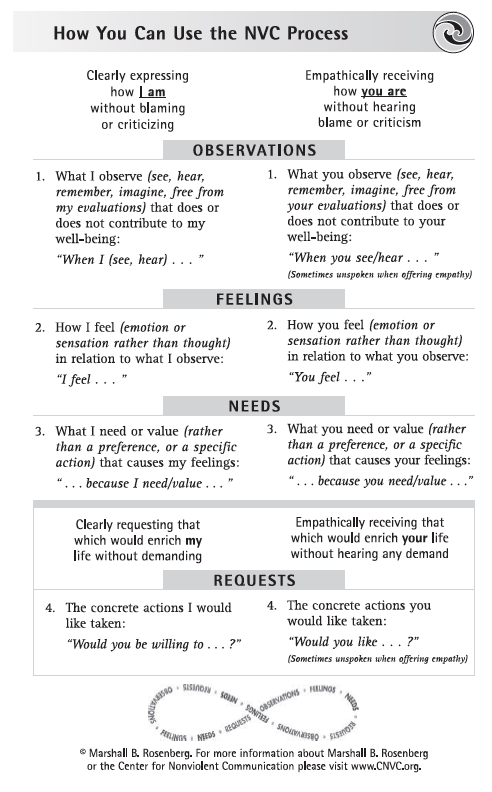 Whether you click on the graphic or download the PDF here – 4part_nvc_process – you’ll have a brief over-view of a hugely helpful 4 part process for figuring out how to have a conversation about needs that not only helps you get those needs met, but also deepens your relationship. This is such a super important issue for great relationships, I’m dedicating the whole month of August to the topic. So – do please come back! mid-14c., “living together, having dealings with others,” also “manner of conducting oneself in the world;” from Old French conversation, from Latin conversationem (nominative conversatio) “act of living with,” noun of action from past participle stem of conversari “to live with, keep company with,” literally “turn about with,” from Latin com- “with” (see com-) + vertare, frequentative of vertere (see versus). which seems to imply a more snap-shot of what is than a transformative anything. However, the fact of living together and being with one another can be transformative. I’ve seen it in my work for years. We can be called forth to be better. Again, a lofty topic worth taking time over, and here is a wonderful little book that will help you get there, from Mona Barbera. Two key concepts to whet your appetite? The intense pain you think [the other person] is causing is really your own. No matter what [the other person] is dishing out, you can choose to give better back. 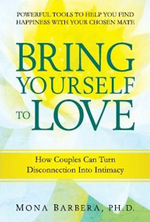 Mona’s book is targeting couples, but her ideas are universal and can absolutely help you use these forms of Transformative Conversation to do just that – to become a bigger you. Another whopper as far as relationship resiliency goes, and one that is getting covered in depth in October (Apologizing) and November (Forgiving). Come Fall, I’ll rework these articles – so again, do come back! This entry was posted in Communication, Couples, Personal Growth, Relationship Skills and tagged apologizing, Bring Yourself to Love, Compassionate Communication, connecting, conversation assumptions, Dan Wile, Five types of conversation, forgiveenss, Give Better back, Haim Ginott, How to apologize, how to connect with someone, how to converse, how to forgive, how to have a conversation, How to stay interesting in a long term relationship, how to stay interesting in marriage, How To Talk So Kids Will LIsten, how to talk to someone else, how to talk with another person, Marshall Rosenberg, Mona Barbera, Non-Violent Communication on April 1, 2015 by gemmautting.